Today the little St. Mary’s engine was settled onto its new base. This was fun to watch. I stayed out of the way so that there was plenty of room for everyone to work. Here the engine is getting lifted off the ground. Since engines are made of iron and other metals they are really heavy – even the small ones. Done! Doesn’t it look great? I hear that starting it might be easier now too. (giggling) The first start of the weekend came with a rain of walnuts. See the little round black things on the ground? (Look closely at the floor between the fuel can and the boot - I think if you click on the picture it will enlarge to see better.) Squirrels think the exhaust tubes make great storage areas. Unfortunately, they would be better off finding another place. Now, the St. Mary's is happy and running nicely. Xyra had a little fun with her new engine. This one will eventually be set up by her doll house. Then we went to check out the engine they had this running yesterday. And the Miller…again. Yes, this one is in the top 5 of favorite engines. After dinner...(boy, were we lucky. The Community Center spaghetti supper was almost sold out when we arrived. They had enough for 5 more dinners and it was only 5:30. Must get their earlier in October. Very tasty spaghetti with meatballs, salad, and dessert. )…we watched the Parmaco, St. Mary’s, Victory, and both Thermoils run. You can see the 7hp exhaust plume just behind the roller. Come back again to see our last day. Note: If you click the links above you will go to the main exhibits page. To see more about the Miller scroll down to Nate Lillibridge Station and click tour. For the Parmeco and Thermoils, scroll down to Power Technology Annex and click Tour. This morning is much calmer than last night. Several storms rolled through after dinner and overnight. After a great breakfast of pancakes, bacon, eggs, sausage, and chocolate milk we went back to the Power Tech Annex. That was our "home base" while we were here. This is the skid that was built for the little St. Mary's engine. Xyra painted it last night during the storms. This is what it looked like being assembled yesterday. Still more to do before it is finished, but it looks nice. This is the engine that will go on the skid. This building always had something moving. If you look closely at the flywheels, you can see three engines are running. By the end of the day 9 engines in this one building were moving. And many, many more all over the museum. Here you can see the Victory and the Reid (the red one in the back) are running. Can you see the motion in the still picture? After dinner the DeLevergne up on the hill was running. Professor M! I got to meet him this year...Melody is right, he's cool! That's all for today. More later. After 5 or 5 1/2 hours on the road we pulled into Coolspring Power Museum. Before exhibitors can park, they have to check in with Jake. He tells you best place to set up. It was really wet this year, so he had a big challenge. If you need Jake, just look for his buggy. Time to stretch our legs. Our first stop was the Founder's Engine House. The Meitz and Weiss was running. It was my favorite in this building. The Buffalo Olin was neat too. Then it was off to the Gift Shoppe. What do you think of this? Looks like a comfy nightgown to me. Hmmm, I hope that crocodile behind me isn't hungry. On our way to the Power Tech Annex, we stopped at the Half Breed Pavilion. These engines are built to work with steam or oil. This is the Evans.It was built in Corry, PA during the 1880s. It ran an oil pump near Chicora. Then we went into the Power Technology Building where we saw this Twin Bessemer. And Xyra's favorite, the DeLavergne Hornsby-Akaroyd. The first thing you see as you go through the door from the Power Tech building to the Power Tech Annex is the Buffalo-Springfield road roller. You're not supposed to climb on this; however, we had permission and were supervised. Plus today was exhibitors and volunteers only, no public. We obeyed all the rules while the public was on the grounds. This is one of our favorite engines in this building. It is 7hp Thermoil U Hvid. Which means it is a diesel engine. This pretty bench is in Nate Lillibridge Station. There are benches scattered throughout the museum so you can rest and watch the engines run. This building houses this 300hp Miller. It's really big, but not the biggest engine at the museum. This engine is in the Windy City building and helps start the big Blaisdell engine. That's all for day one. Come back again to see day 2. Note: Click the links above to go to the CPM Exhibits page. Then scroll down for each building. Click "Tour" to see which engines are in that building and read about how they work or what they were used for before they found a home at the museum. My friend, Lexxie, who writes the (un)Conventional Book Reviews blog follows the rules for Feature & Follow Friday. Since we are not strictly a book blog I haven't jumped into that schedule. However, this week's topic was too cool to pass up. So while I am answering the question - I'm not quite sticking to the rules of becoming a follower of Rachel at Parajunkee's View or Alison from Alison Can Read, but I will point you in their direction. Lexxie reads everything, but tends toward adult romances; Parajunkee seems to focus on fantasy, science fiction, and urban fantasy; Alison seems to be partial to manga. If you don't follow this blog the title should give away that I'm a tea drinker, but I like my tea in a mug as well as a regular tea cup. I have several favorites, but this is the one I use every day. It was designed for me by a dear friend. 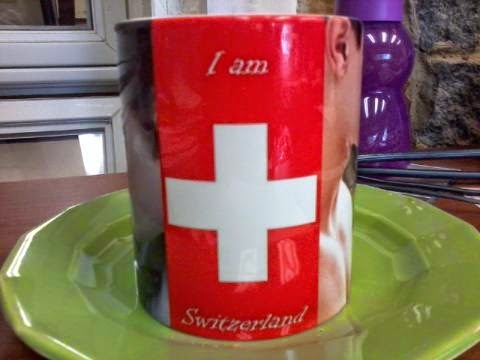 It is based on the Twilight saga and says, "I am Switzerland." To the left of the flag is Edward and Bella; to the right Jacob and Bella. Do you have a favorite mug? 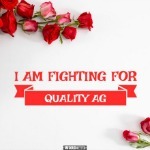 Send your picture to melodyq2000 [at] gmail [dot] com. Hello, Rebecca! Don't you look nice. Turn around - let me see the whole thing. Good, I have one for you too! The dresses were found at The Queen's Treasures.